An ocean block in Lavallette, with lined parking spaces. The debate rages in Lavallette and Seaside Park: to line, or not to line. Both towns, in recent years, have experimenting with painting boxes around what they believe constitutes a legal parking space. The problem is that for every Range Rover owner who needs 20 feet of breathing room, there’s a Prius owner who could squeeze into much smaller quarters. The towns are learning that, ultimately, you’ll never please everyone. 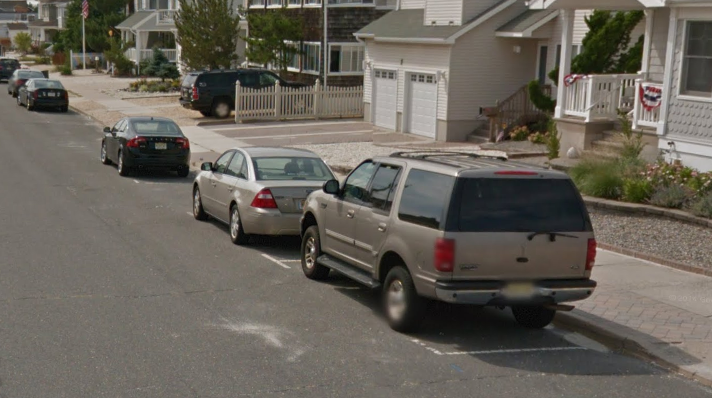 In Lavallette, a resident recently asked the borough council if it would be illegal to paint over the white lines on his street, since police officers had given tickets to vehicles parking two-to-a-space, even though both vehicles were able to fit. The issue of lined spaces – called T boxes – on streets where motorists park parallel to the curb, has flared up since the trend of builder higher and wider began after Superstorm Sandy. With new homes, come required curbing, and sometimes multiple driveways. Parking is sometimes at such a premium where people will resort to desperate measures – eschewing a space in their own driveway to save a street space for a friend or relative – which can sometimes ruffle the feathers of neighbors. Eventually, Larkin said, the department began painting over the “illegal” driveways markings. In Lavallette and Seaside Park, parking spaces disappeared after the rebuilding of Route 35, when the state decided to adhere to more stringent regulations on crosswalks which prevented spaces near intersection from being remarked. That has pushed more cars onto side streets, just as spaces there are disappearing as homes grow larger. In Seaside Park, Larkin said the spaces are either 17 feet long or 20 feet long, depending on how much room there is between areas where parking is allowed. The town, he said, tries to fit as many spaces into a single block as possible. In Lavallette, the current practice – except for some ocean blocks – is no longer to line streets, while in Seaside Park, the issue is still up in the air following an experimental markup on 6th Avenue. For municipal leaders, some lessons have already been learned. “We’re not going to stick to the 20 [feet], which is what’s in the north end of town,” said Larkin.